The Federal Railroad Administration (FRA) is an agency in the United States Department of Transportation (DOT). The agency was created by the Department of Transportation Act of 1966. 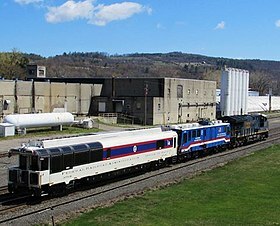 The purpose of FRA is to promulgate and enforce rail safety regulations, administer railroad assistance programs, conduct research and development in support of improved railroad safety and national rail transportation policy, provide for the rehabilitation of Northeast Corridor rail passenger service, and consolidate government support of rail transportation activities. The FRA is one of 10 agencies within DOT concerned with intermodal transportation. It operates through seven divisions under the offices of the Administrator and Deputy Administrator. These divisions are: Financial Management and Administration, Chief Counsel, Civil Rights, Public Affairs, Public Engagement, Railroad Policy and Development, and Safety. It has a staff of about 850. The FRA oversees both passenger (top) and freight (bottom) rail operations in the United States. 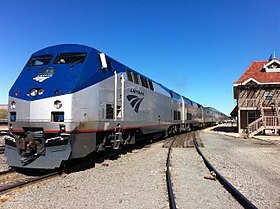 All passenger and freight rail travel in the United States on the national interconnected rail infrastructure is subject to regulation by the FRA. FRA regulates public and intercity rail services, but does not regulate "closed" railways that operate exclusively on private property, such as a rail system between buildings at a steel mill, nor does it regulate subways, light rail or elevated intra-city passenger rail systems that do not connect to any public rail networks. Most notably, the FRA enforces safety regulations, such as speed limits and requirements for safety features such as positive train control. Non-legislative recommendations for FRA policy come from the Rail Safety Advisory Committee, established in 1996, though much of FRA policy is created via congressional legislation; for example, the Rail Safety Improvement Act of 2008 was an act of Congress, to which the FRA enforced through a series of regulations published two years later. These regulations include enforcement of positive train control and enforcement of more stringent conductor certification requirements. In 2011, the FRA began the process of updating its electronic device policy for active train operators. In June 2015, the FRA announced a railway safety initiative with Google that would include the FRAs GIS data into its mapping services. The data pinpoints the location of over 250,000 rail crossings in the United States. The FRA believes that providing the location of rail crossings in maps will enhance crossing safety by people who are using navigation systems while driving. Sarah Feinberg was the Administrator of the FRA from 2015 to 2017. Feinberg was the second woman to lead the agency. Her appointment was announced by United States Secretary of Transportation Anthony Foxx on January 12, 2015 and confirmed on October 28, 2015. Feinberg had previously served as Foxx's Chief of Staff, managing DOT's ten modal organizations, and spearheading its legislative, policy, and communications efforts. Feinberg's tenure as Administrator featured a greater emphasis on the enforcement of safety rules and regulations relative to her predecessors. Joe Szabo was the first FRA Administrator to be chosen from the ranks of railroad employment..
Patrick T. Warren, Executive Director of the FRA, was an acting Administrator pending the appointment and confirmation of a new Administrator. On 10 February 2018, Heath Hall, the acting Federal Railroad Administration chief since June 2017, resigned "effective immediately" over a Politico report that he has a second job as a public relations consultant for a local sheriff’s department in Madison County, Mississippi. Head counsel Juan Reyes, named acting deputy administrator in January 2018, is now the acting chief. Presidential nominee Ronald Batory is awaiting confirmation for the position. The FRA’s Northeast Corridor (NEC) Future is a long-term plan aimed at improving the nation’s Northeast Corridor. The NEC Future plan consists of four components, also known as the Selective Alternative, which are: Improve rail service, Modernize NEC infrastructure, Expand rail capacity, and Study New Haven to Providence capacity. These four components all aim to improve the reliability and performance of the NEC system, whether it be through intercity or regional means. The Selective Alternative looks to do four major things: Improve rail service by increasing frequency of trains, decreasing travel time, and making better passenger convenience; Modernize NEC infrastructure by having corridor-wide repair and replacing and fixing parts to bring the entire system to increased reliability; Expand rail capacity by adding new infrastructure between cities and increasing train speeds and capacity; and Study New Haven to Providence capacity. The NEC Future ROD (Record of Decision) was issued in July 2017, which marked the completion of the Tier 1 environmental review process. The ROD lays out everything involved with the project, including the plan itself and feedback from individuals, organizations, and stakeholders. There is no listed completion date for the NEC Future and Selective Alternative. The need for an NRP was brought up in the Passenger Rail Investment and Improvement Act of 2008. However, before the official plan could be drafted, the Passenger Rail Investment and Improvement Act (PRIIA) required a Preliminary National Rail Plan (PNRP) to be made first, which was submitted to congress on October 15, 2009. On December 16, 2009 the Consolidated Appropriations Act of 2010 was enacted into law and established the delivery date for the NRP. The delivery date for the NRP was September 15, 2010. With the nation’s infrastructure growing, the transportation used in the nation also needs to grow. With that in mind, the NRP’s main goal is to increase the size of the nation’s railway capacity to include 70 million more people and 2.8 billion tons more of freight within the next 25 years, and 100 million more people and 4 billion tons more of freight within the next 40 years. The NRP also looks to continue improving the rail systems safety. Another one of the NRP’s big goals is the introduction of a high-speed train made for intercity travel. These trains would be much faster than normal trains, ranging in speed from 125–250 mph (201–402 km/h), and capable of delivering a passenger 500 miles (800 km) in about 2-3 hours. In smaller, regional areas, the trains would not be as quick, only going somewhere between 90–125 mph (145–201 km/h). There are no set costs for this system, however. But the FRA argues that the benefits a high-speed rail system would bring outweigh the costs for the system, claiming that the high-speed rail system would reduce car traffic and eliminate the need for short-haul flights. It would also reduce congestion in America’s more populated regions and boost manufacturing activity. The Federal Transit Administration provides financial and technical assistance to local public transit agencies. The Interstate Commerce Commission regulated railroad safety prior to creation of the FRA. Currently defunct. The National Transportation Safety Board investigates transportation accidents and crashes, including those involving railroads. The United States Railroad Administration operated from 1917 to 1920, currently defunct. ^ "U.S. Department of Transportation Fiscal Year 2009 Budget In Brief". Retrieved February 26, 2011. ^ United States. Department of Transportation Act. 49 U.S.C. § 103, section 3(e)(1). ^ Federal Railroad Administration (2010). Washington, DC. "About the FRA." Archived 2010-09-14 at the Wayback Machine Accessed 2010-08-28. ^ In this article http://www.alexblock.net/blog/2015/10/06/wmata-the-ntsb-and-the-fra-or-what-do-you-mean-the-metro-doesnt-count-as-a-railroad/ (Retrieved May 7, 2018), a subway or metro system that does not use infrastructure accessible from other networks, such as Washington DC's Metrorail system, the Chicago "L", or the New York City Subway, is not a "railroad" and FRA lacks jurisdiction over its operations. ^ "Railroad Safety". Federal Railroad Administration. United States Department of Transportation. Retrieved November 28, 2017. ^ "Railroad Safety Advisory Committee". Federal Railroad Administration. United States Department of Transportation. Retrieved November 28, 2017. ^ "Positive Train Control Systems". Federal Register. United States Office of the Federal Register. Retrieved November 28, 2017. ^ "Positive Train Control". Federal Railroad Administration. United States Department of Transportation. Retrieved November 28, 2017. ^ "Conductor Certification". Federal Railroad Administration. United States Department of Transportation. Retrieved November 28, 2017. ^ "Electronic Device Distraction". Federal Railroad Administration. United States Department of Transportation. Retrieved November 28, 2017. ^ "Google, FRA team up for safety; will add rail crossing data to maps". June 29, 2015. Retrieved April 27, 2016. ^ Mouawad, Jad (June 29, 2015). "Agency Taps Mapping Technology to Curb Rail Crossing Accidents". New York Times. Retrieved April 27, 2016. ^ "Heads of Operating Administrations". United States Department of Transportation, Office of the Historian. Retrieved November 28, 2017. ^ "Joseph H. Boardman Begins Role as New Administrator for Federal Railroad Administration With Focus on Rail Safety and Intercity Passenger Rail Reform" (Press release). FRA. June 1, 2005. Archived from the original on October 28, 2005. Retrieved June 6, 2005. ^ Progressive Railroading (April 30, 2009). "Senate confirms Szabo's nomination as FRA administrator". Brotherhood of Locomotive Engineers and Trainmen. Retrieved May 3, 2009. ^ a b Michael Laris; Ashley Halsey III (October 28, 2015). "Sarah Feinberg confirmed as new head of Federal Railroad Administration". The Washington Post. Retrieved November 19, 2015. ^ "U.S Transportation Secretary Foxx Names Sarah Feinberg Acting Administrator of FRA". Briefing Room. Federal Railroad Administration. January 12, 2015. Press release. ^ "Exiting rail safety chief Feinberg looks to technology to save lives". lohud.com. Retrieved February 28, 2017. ^ "FRA's Szabo announces resignation". Metro Magazine. Retrieved April 8, 2015. ^ "Senate confirms UTU's Szabo to FRA". UTU News. United Transportation Union. April 29, 2009. Archived from the original on June 12, 2011. Retrieved May 3, 2009. ^ "U.S. rail official steps down after questions raised over outside work". Reuters. February 10, 2018. Retrieved February 11, 2018. ^ "Top Railroad Safety Official Resigns, Amid Questions About Holding A Second Job". NPR. February 10, 2018. Retrieved February 11, 2018. ^ a b "NEC Future". Federal Railroad Administration. Retrieved October 16, 2018. ^ Reyes-Alicea, Rebecca (July 2017). "NEC Future: Record of Decision". Federal Railroad Administration. Retrieved October 16, 2018. ^ "NEC Future: Selected Alternative Description". Federal Railroad Administration. Retrieved October 16, 2018. ^ Rae, Karen (April 5, 2010). "National Rail Plan". Regulations.gov. Retrieved October 16, 2018. ^ a b Federal Railroad Administration (September 20, 2010). "National Rail Plan Progress Report". Federal Railroad Administration. Retrieved October 16, 2018. This article incorporates public domain material from websites or documents of the United States Department of Transportation. 1966 establishments in Washington, D.C.